This Z Reader on Empire contains selected articles from Z Magazine from 1988 to 2012. The articles cover the many ways–and institutions–the U.S. uses to build, maintain, and expand its empire. These include genocide, intervention, occupation, structural adjustment, the media, the UN, NATO, drones, death squads, theft, appropriation of resources, “free trade,” violations of international law and the U.S. Constitution. 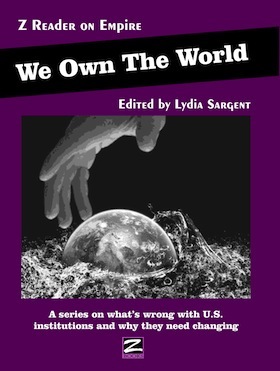 You can purchase We Own The World as an EBook for Amazon, Kindle for $3, or in Print from ZStore for $15. This Z Reader on Patriarchy contains 28 essays by such writers as bell hooks, Sheila Rowbotham, Lydia Sargent, Ann Popkin, Lynne Segal, Sonia Shah, Midge Quandt, and many others. These essays, written between 1988 and 2012, all appeared either in Z Magazine, Z Papers, ZNet, transcribed from Z Video Productions, or as a course handout for Z Media Institute. While they mainly cover the women’s movement in the U.S., they also cover issues affecting women in Europe, Latin America, and Asia. Part one defines women’s efforts toward revolution and details the importance of understanding the meaning of the “personal is political”. Part two looks at feminist politics after the 1960s. Part Three looks at global issues. Part Four focuses on alternatives. 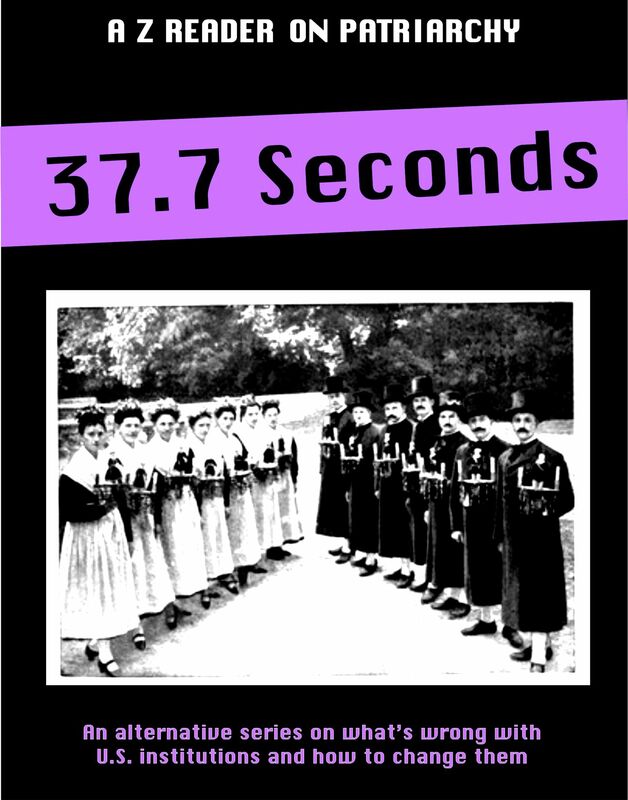 You can purchase 37.7 Seconds as an EBook for Amazon, Kindle for $3, or in Print from ZStore for $15. Occupy Theory develops a shared set of accessible concepts for conceiving what people want for society and developing a strategy for getting it. Occupy Theory argues that current society threatens human existence and stifles human fulfillment and development. It locates and investigates the causes of social problems in the structure of economy, kinship, culture, and polity, providing concepts and analysis for movement activism. 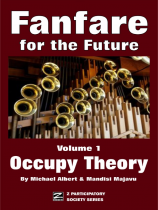 You can purchase Occupy Theory as an ebook for kindle, or as an ebook for the ipad, each for $3, or in print from the ZStore for $15. You can also purchase the three (print) Fanfare titles all together for the reduced rate of $30, or only $10 each. Occupy Vision addresses economics, politics, kinship, culture, ecology, and international relations. For each, it offers an alternative way of conducting life based on new guiding values and institutional arrangements. The result is not capitalist, not 20th century socialist, not authoritarian, not sexist or heterosexist, not racist or nationalistic, not ecocidal, and not imperialist. It is, instead, participatory economic, self managing, feminist, intercommunalist, and peaceful. It is solidarity, horizontalism, and self management made viable. 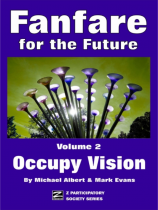 You can purchase Occupy Vision as an ebook for kindle, or as an ebook for the ipad (coming very soon), each for $3, or in print from the ZStore for $15. You can also purchase the three (print) Fanfare titles all together for the reduced rate of $30, or only $10 each. You can purchase Occupy Strategy as an ebook for kindle, or as an ebook for the ipad, each for $3, or in print from the ZStore for $15. You can also purchase the three (print) Fanfare titles all together for the reduced rate of $30, or only $10 each. ZBooks are $15 in print and $3 for ipad or kindle format. Z Videos (transcribed), and Z Media Institute courses.